All transactions are safe and secure with a reliable history in online purchasing behind each of our associates. Buy the I'm Not Sayin' I'm Batman t-shirt to own Batman clothing and merchandise. One of our most popular items from our selection of Batman clothes, this funny Batman tee features the humorous message, "I'm not saying I'm Batman. I'm just saying no one has ever seen me and Batman in a room together." This Dark Knight t-shirt just might convince your friends that you're the Caped Crusader. It's the perfect gift for the Dark Knight in your life, even if he or she doesn't work in Gotham City and drive the Batmobile. This Batman tee shirt is fun piece of Gotham inspired apparel. 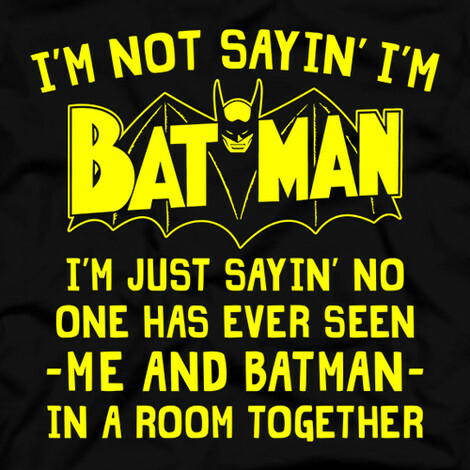 In addition to the I'm Not Sayin' I'm Batman tee above, browse the Batman Clothing Gallery for more apparel like men's and women's clothes, kids shirts or hoodies.